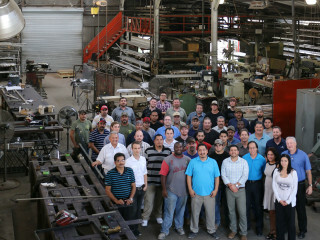 The 2014 AIA Houston Honor Awards Committee selected Berger Iron Works to be the recipient of the Artisan of the Year Award. This exhibit will feature project photos, shop drawings, historical documents and materials alongside model and sample work. The 2015 AIA Houston Design Awards will also be on exhibit in the main gallery. In 1893, A.A. Berger began fabricating ornamental iron work for residences and office buildings. By the 1930's Berger was the choice of many of the most elegant estates in Houston, Galveston, and the surrounding areas. As Houston grew, the company diversified and in the 1940's Berger helped to supply the U.S. war effort with fabricated iron and wire products. Incorporated in 1954 as Berger Iron Works, Inc., the company has now been in continuous operation for 120 years. Today, Berger manufactures architectural and miscellaneous metals predominantly for the commercial construction industry while maintaining it's ability to work on industrial projects and high-end residential projects. Following the opening reception, the exhibit will be on display through October 30.